Thursday began for Kobe Bryant with apparent good news — despite missing most of the season recovering from an Achilles injury, he has the No. 2-selling jersey in the NBA. And with Christmas just around the corner, it made sense that the king of Christmas hoops would still be a highly desired gift. This will be Kobe Bryant's 16th Christmas game (an NBA record). Second is Dolph Schayes, Earl Monroe and Shaq with 13 Christmas games each. Then the basketball world was reminded that no one’s immune from a lump of coal, not even Showtime and Mamba. 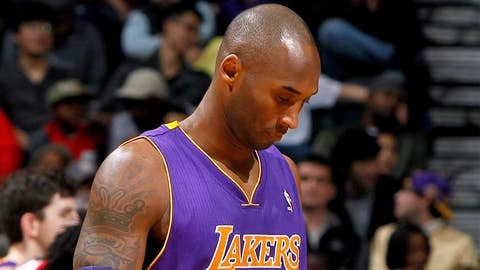 For his part, Kobe vowed to remain undeterred, despite another injury setback. And some other stars in the league wished him well and lamented the loss for the league. Kobe can't catch a break. And his Lakers teammates also wished him a speedy recovery, but pledged to continue to fight on without their star. And there was this, yet another reminder of Kobe’s popularity. Kobe Bryant will still very likely be voted as a starter for the All-Star game, which is just under eight weeks away. And a reminder of how human he is. “@ball709: @KBergCBS Kobe is the kind of guy that just don't go away”. Sorry, but EVERYONE goes away at some point! But perhaps nowhere will Bryant’s absence be felt more than . . . the NFL? Look how many people from the world of football gave shout-outs to Bryant. Hoping fellow @nike guy @kobebryant heals up soon! Praying for my man @kobebryant just awful luck!